[Pete] had some spare time on his hands over his spring break, and he was itching to build something. He settled on a laser light show since, after all it was spring break, and what says “Party” better than a laser light show? 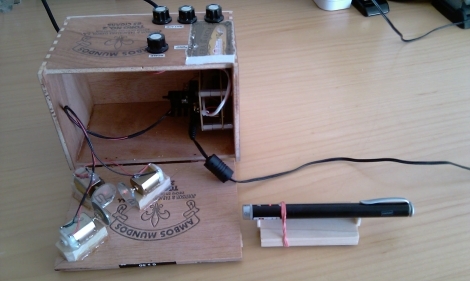 He glued three hobby mirrors to three small motors, mounting the motor assemblies on the lid of a wooden cigar box he bought for next to nothing. When the laser is pointed at the mirrors, they reflect the beam off one another, and finally against a projection surface, creating interesting shapes and motion. He programmed an Atmega328 to control the laser light show when in automatic mode, and added 4 pots to control the mirrors’ spin rate when set in manual mode. The visuals are pretty cool, as you can see in the videos below. We love the laser light show concept, and [Pete] definitely gets extra points for his cigar-box casing as well. A while ago i built something similar, but i glued mirrors to two speakers and played music through them, the vibration from the speakers moved the mirrors and made cool patterns with the laser. My brother made a similar hack years ago. He used a couple of old speakers as well, hinging the mirror mounts on different axis to get more movement. As I recall he hooked some guitar effects pedals up for some more interesting effects. -then we pointed the laser at our neighbor’s Harley and made him think it was still turned on for a minute until he blocked the beam. That is a very cool effect for such a simple setup. Has anyone come across similar reflected laser projects that do more than just spirograph / beat visualization? Pfff. You should be at a bar *enjoying* a laser light show for spring break – not building one. Silly nerds – go get drunk like a normal person. @anon. I’m my own boss. And nerds don’t move up to management – they lack the people skills. Most likely ’cause they sat home during spring break and played with lasers. Theres another project on the net that connects a custom built scanner to a pc. Then a linux program runs and creates the movement in the servos, the guy does some neat stuff with them.